SNAFU! : In Louisiana we have highways masquerading as tank trails, in Michigan they have potholes acting like sinkholes! 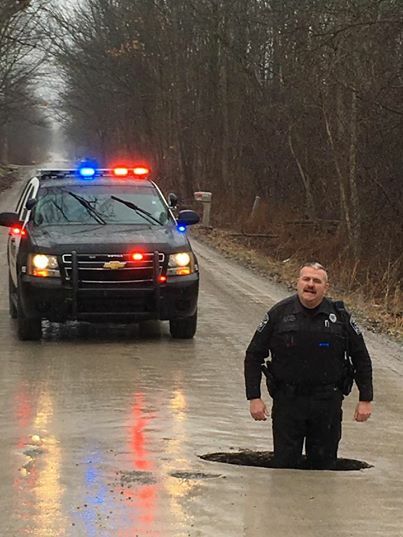 In Louisiana we have highways masquerading as tank trails, in Michigan they have potholes acting like sinkholes! The pic is from Jalopnick, an automotive mag, and they've been having a field day with the potholes in Michigan. In Detroit they have ongoing coverage of drivers literally blowing out their tires and busting wheels on a pothole. The local media has even gone out to film it. But what you see above is an ABSOLUTE danger to life and limb. That law enforcement bubba is six three so that hole must be at least a couple of feet deep. You're driving along and hit something like that? Your car will literally flip end over end (if you're going fast enough) and if not then you will be kissing your air bag, hoping you haven't broken your nose or worse. A couple of weeks ago I was gonna blog about a trip I had to make from Central Louisiana down to Baton Rouge. I took I-49 down but on the way back I decided to take the scenic route and go on Hwy 71. About 5 miles outside a hamlet called LeBeau I ran into the worse road I've ever seen. It looked like a tank trail and the top speed of everyone (to include big rigs) was 25mph. The road was so bad that even that was iffy. Trump's instincts are right. We need to do something about our infrastructure nationwide. Enough with the foreign wars. If he's serious about making America great then he should SLAM thru his bill to rebuild America!